An all-solid-state battery would revolutionise the electric vehicles of the future. The successful implementation of an alkali metal negative electrode and the replacement of the flammable organic liquid electrolytes, currently used in Li-ion batteries, with a solid would increase the range of the battery and address the safety concerns. 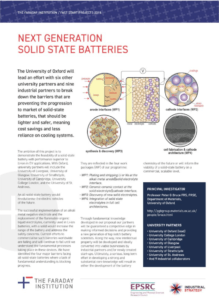 Current efforts to commercialise such batteries worldwide are failing and will continue to fail until we understand the fundamental processes taking place in these devices. We have identified the four major barriers facing all-solid-state batteries where a lack of fundamental understanding is blocking progress. • WP1: Plating and stripping Li or Na at the alkali metal anode||solid electrolyte interface. 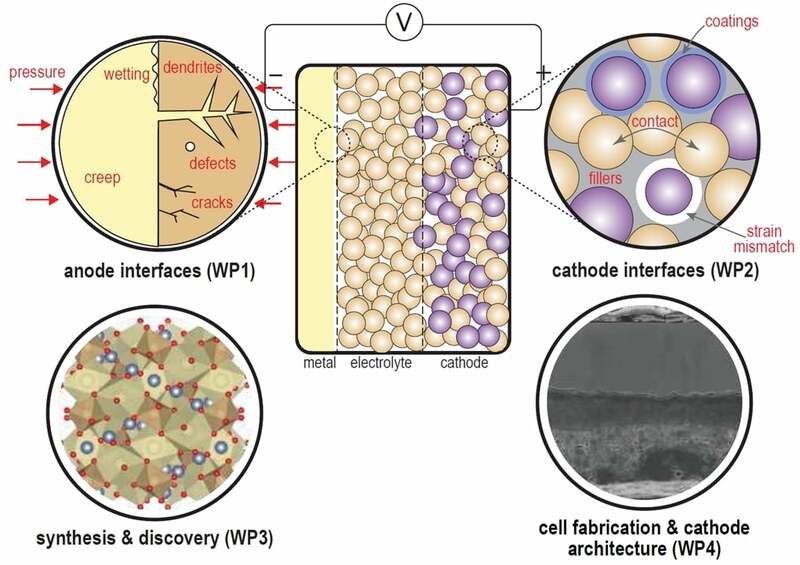 • WP2: Ceramic-ceramic contact at the solid electrolyte||cathode interface. • WP3: Discovery of new solid electrolytes. • WP4: Integration of solid state electrolytes in full cell architectures. Through fundamental knowledge developed in our proposal our partners will be guaranteed a competitive edge in making informed decisions and providing a new generation of top notch battery scientists. Along the way, new intellectual property will be developed and ideally converted into viable businesses by industrial partners and/or newly created start-ups. Ultimately, a serious, long-term effort in developing a strong and substantial core knowledge will result in either the development of the battery chemistry of the future or will inform the viability of a solid-state battery on a commercial, scalable level. For further details see the project's website.